It's the first ever Walk the Plank Wednesday (WtPW)! 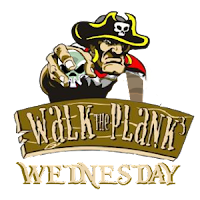 What is Walk the Plank Wednesday? Walk the Plank Wednesday is a new post I am doing on the 3rd Wednesday of every month. It won't be your average post (hence the title), but it will be a contest type thing. You can win stuff such as KIFG Codes, Hoards, and maybe once in a while Crowns! You just follow the instructions in that post and hope you win! Now, onto this months Walk the Plank Wednesday! For this months WtPW, I would like you to leave a comment explaining what you look forward to the most in Pirate101. You can talk about anything relating to Pirate101. Combat, Housing, Graphics etc. I will then go through the entries and pick the one I think is the best and that winner will get a Tier 7 KIFG code. I look forward to seeing what creative things you all have to say about Pirate101. Good luck and see you in the Spiral! What I look forward to the most in Pirate101 is probably what it holds. Since I didn't get to be in closed beta, I got to wait until it gets released. That's OK because it makes the wait all the more rewarding. So just to summarize, I am looking forward to just seeing what it has in store. I look forward to seeing all the new NPC's and different battle tactics as well as companions. I look forward to seeing all the companions and awesome pirate ships. I'm also looking forward to the names in Pirate101! I heard they are awesome.